1. First, heat a frying pan, then add the sugar and brown slightly. 2. Add the butter and stir in the cranberries, citrus zest and cinnamon. Cook for 3 mins. 3. 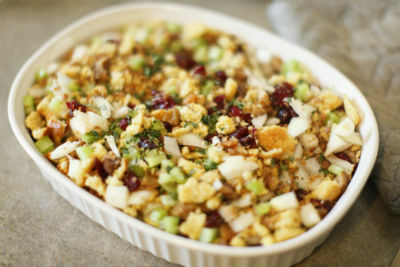 Place into a bowl, and add the toasted bread crumbs and juice, then mix well. 4. Put the mixture into a buttered tin, and cook for 30 mins at 180c, until browned.